The Public Calendar page displays all up-coming Events. Use the filters at the top of the page to display the desired items. 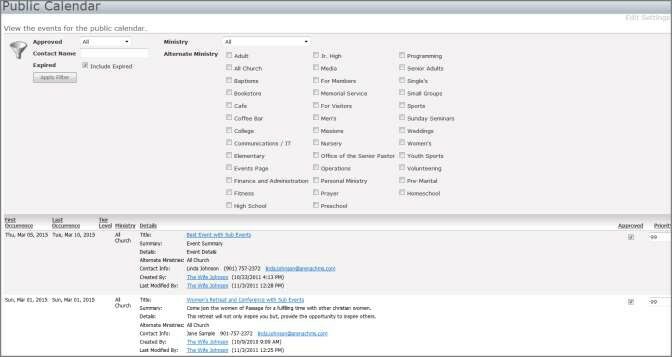 The list displays the First Occurrence, Last Occurrence, Tier Level, Ministry (Topic Area), Details, Approved, and Priority. The Details column lists the Promotions with the title as a link to the Promotion page. Click the Save Changes button to save any changes in the Approved or Priority columns. Use the filters to display desired calendar requests. Click the Title link to view the calendar request. Select the Approved check box to approve the calendar request.